Ayrshire Girls' final competition of the season was played over Barassie Links on Saturday. This was a first time of playing the course for most of the girls and it couldn't have happened on a better day with blue skies and sunshine all afternoon. The winner of the stableford competition was Cristina McCracken (Troon Ladies) playing off 28 who finished on 35 points. Runner-up was Barassie girl Katie Ronnie(30) who had 31 points. 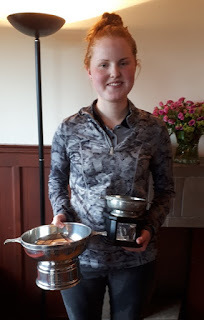 Sarah Ramsay(West Kilbride) was the top silver player on 29 points. The putting competition was won by Melissa. Very well done to all the girls who played today. 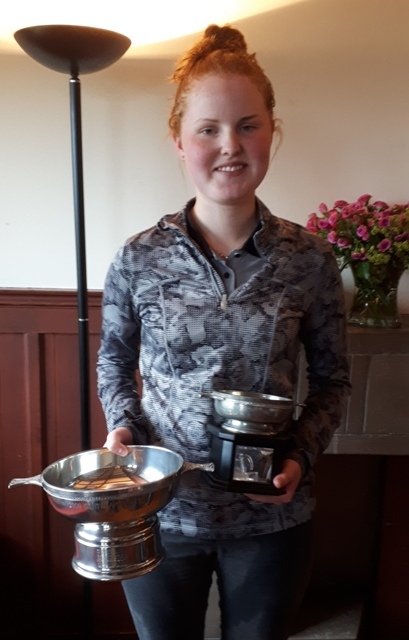 Cristina is pictured with the Centenary Trophy along with the runner-up trophy for the West Girls' Bronze Championship.